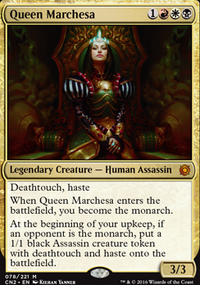 Hello and welcome to my build of Queen Marchesa . This deck is a flexible toolbox deck which relies on consistency and cheap efficient threats to win. This is a deck that really never wins the game early - but works on making victory an inevitability. The games that you can expect to play with this deck will be highly interactive and down to the wire - never boring! This deck also is not linear - every game will be different! This deck works hard to prevent yourself from dying in order to win later. Consistent yet not linear. This deck is what I like to call the 100% 75% deck. It doesn't do anything unfair; it doesn't employ any infinite combos and it lets other players play their decks, but it is 100% built to be strong and earn every win. ...you like having flexibility and making tricky decisions while playing. ...you like to play proactively yet patiently. ...you like having answers to almost every situation. ...you like a consistent deck. ...you like a deck that can kill players out of nowhere. ...you like a deck that can virtually secure the win without your opponents knowing that it is coming. ...you like a deck that can recover well. ...(More than anything) you like feeling like you fought tooth and nail for / truly earned every victory! ...like attacking with a 50/50 Dragon with trample, haste, indestructible, hexproof and horsemanship. ...like heavy creature based decks. ...like tripling your mana or ramping for a million lands. Generally speaking this deck doesn't do huge ridiculous plays, but enjoys playing lean and mean and pretty much as fair as magic can get. This deck is also a long term altering project with my end goal being having the entire deck altered - including the basic lands. I do the alters myself so its often whenever I feel in the mood to paint. Sometimes I won't paint a single card for months, other times I'll paint 10 in a weekend. Its getting there though! I appreciate all comments, questions and/or suggestions. I’ve been thinking about this deck more than I’ve played it for the last few months, I’m sure a lot of people can relate to the struggle to find the time or people to play EDH with. I went through a period of time where I played a lot of games on the free service Xmage which was really enjoyable and allowed me to hone the deck even more. One overall philisophical change I believe I’ve made (At least in my mental approach to playing this deck) is consistency. Specifically; consistency in land drops. One consistent trend I have found after playing hundreds of games with this deck is that the more lands I have in play the more confident I am in winning the game. In the EDH podcast Game Knights they tracked hundreds of EDH games and found that the winning player consistently had the most lands in play. Countless articles have been written about the correct number of lands to run - including complex maths to account for every possible scenario. And I feel that I’m finally coming to understand the obsession about lands. I now approach each game I play with a rather simple goal: to play a land each turn, or to finish the game with almost as many lands as there have been turns. It may be an unexciting goal but I have found it is an effective way to do well in an EDH game. One of the things that makes this particular deck strong is its flexibility and options, but those strengths are negated when the pilot is stuck for mana. If doesn’t matter the strength or synergy of the cards you have in your deck if you can’t cast them when it really matters. All of this might be fairly obvious to some, and I think the concept is certainly easy to grasp - but the execution is what counts. For me its a matter of mulliganing more if I don’t have enough lands to really get going, or tutoring for lands if it means that I won’t miss a crucial land drop. 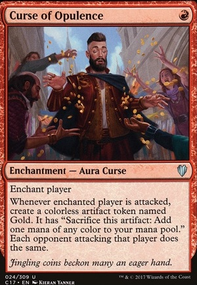 It means looking at the spells in my hand that I really want to be able to cast and plan out how I might get there without simply hoping to top deck a land or two. I am eager to hear other’s experiences or views on this matter so please share in the comments below! As some may have noticed as well - the number of altered cards has crept up over the months. I only have 3 cards left in my paper deck to alter. Hopefully in the next week this massive project will be complete and I will be able to upload a gallery of the complete altered deck. I am very excited for that as it has been a mammoth effort and I am very much looking forward to putting down the brush for a while.